on someone else's property or a store? Our experienced attorneys can help get you back on your feet. One minute you're walking along when all of a sudden you hit the ground hard. It takes you a second to register what even happened. The embarrassment you feel causes you to quickly try to stand up, but you soon realize that something's wrong. Scenarios like this play out all across the country on a daily basis. In fact, slip and fall accidents are responsible for countless injuries in Colorado every year, leaving victims dealing with everything from broken bones to spinal or head injuries. If you've suffered a slip and fall accident, then you know how suddenly it can happen – and can change your life forever. Unfortunately, premises liability cases are rarely clear cut. You face a tough legal battle proving fault by the property owner – and the other side knows this. Slip and fall accidents are some of the hardest won cases in Colorado. That's why it's so important to choose a slip and fall accident attorney who has the experience and commitment to stick with you from beginning to end. The Babcock Law Firm is a powerful ally when you've suffered a slip and fall accident due to negligence, representing clients against the largest retail and corporate offenders in Denver, Boulder and throughout Colorado. As the second leading cause of injury in the US, a slip and fall can occur almost instantly and when you least expect it. Although the actual incident only takes a fraction of a second, the effects can last for months or even years later. Some of these accidents can even prove fatal – each year, an estimated 16,000 people lose their lives due to slip & fall accidents. Slip & fall accidents can occur just about anywhere, too. Perhaps you're entering a store on a snowy day and slip on a slick surface. Or, perhaps you're at a party at a neighbor's house and trip over a toy or some other object that's out of place. According to the National Floor Safety Institute, 55% of all slip and fall accidents are caused by hazardous walking surfaces, such as wet floors, defective sidewalks, potholes, torn carpeting, etc. The elderly, in particular, are more susceptible to falling and sustaining a serious injury. More than 30% of people over 65 years of age fall each year and in half of the cases, falls are recurrent. About one in ten falls result in serious injuries such as hip fracture, other fractures, subdural hematoma, or traumatic brain injury. First and foremost, your highest priority should be obtaining medical attention as soon as possible. Your next priority, though, should be taking the necessary steps to obtain compensation for your injuries. If you can, take pictures of the accident area as soon as possible and gather contact information for anyone who witnessed the incident. Keep careful records of all doctors' visits, lost time from work, and expenses you incur in treating your injuries. Then, discuss your case with a qualified, experienced Colorado slip & fall attorney as soon as possible. An experienced, compassionate attorney will take the time to carefully review your case, interview witnesses, & evaluate the accident scene – in person. Known in the legal profession as “premises liability,” Colorado law is quite clear in that property owners are liable for injuries resulting from neglect or outright reckless disregard for the safety of their patrons and guests. Some people shrug off a slip and fall accident as just that—an accident. But the fact is that over 70% of falls in the US happen due to poor maintenance. Perhaps a hazard is present due to poor design. A poorly designed door, for example, can present a trip hazard. Or perhaps a spill that occurs in a restaurant or grocery store isn't cleaned up in a timely manner or clearly marked. Whether you're visiting your local mall, grocery store, or even a neighbor's house for a barbecue, the property owner has a legal duty to take reasonable care to ensure their property is safe. In a public place like a restaurant or mall, that means clearly marking any hazards and cleaning up spills quickly. At a private residence, this often involves ensuring the areas where guests will be are free from hazard. If it can be proven that your accident occurred because a property owner was negligent in their obligation to identify hazards and protect their patrons and guests, you may be entitled to compensation for pain and suffering, medical bills, lost wages, and other damages. While rare, you may even be entitled to punitive damages if it's determined the property owner had reckless disregard for safety. To obtain compensation, you will first have to prove without a doubt that the property owner was indeed negligent in their obligation. This is where an experienced slip and fall attorney in Colorado is critical. "I had the privilege of working with Stephanie Tucker. She was an excellent attorney, she kept me up-to-date on everything going on in my case from beginning to end. I really enjoyed working with her. I would definitely recommend her services to others because she proved that she really cares about her clients and wants to do what she can to help. Thank you Stephanie and Babcock Law firm!" The Babcock Law Firm is highly experienced in personal injury litigation for slip and fall accidents. Lawyers working on the side of the national corporations that may be at fault will do everything they can to make winning your premises liability case next to impossible. And this aggressive litigation demands aggressive representation. Fortunately, we're in your corner. We know how the other side operates. Colorado attorney Mack Babcock, founder of the Babcock Law Firm, used to represent insurance companies and large corporations. 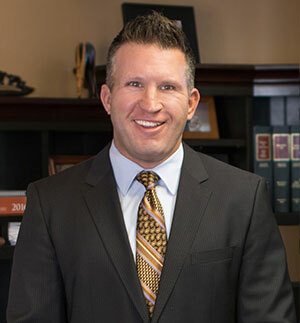 Now, he uses his unique experience to help people like you who are injured in slip and fall accidents to obtain the settlements they deserve. When you're in need of a slip and fall accident attorney, consider our law firm. We fight relentlessly to make sure our clients know they have a slip and fall accident attorney they can rely on. We invite you to discuss the details of your slip and fall case with our experienced Colorado premises liability lawyers. We serve Denver, Boulder, Aurora, Broomfield, Louisville, Lafayette, Golden, Thornton, Westminster and other Colorado cities. If your case falls within our practice area and we feel our representation can benefit you, a knowledgeable attorney will meet with you for an in-depth consultation, at no charge. We're here to help you secure a successful settlement for your Colorado slip and fall claim. Learn more about how representation works and contact us today. Visit our Personal Injury Library and blog to learn more about premises liability accidents.